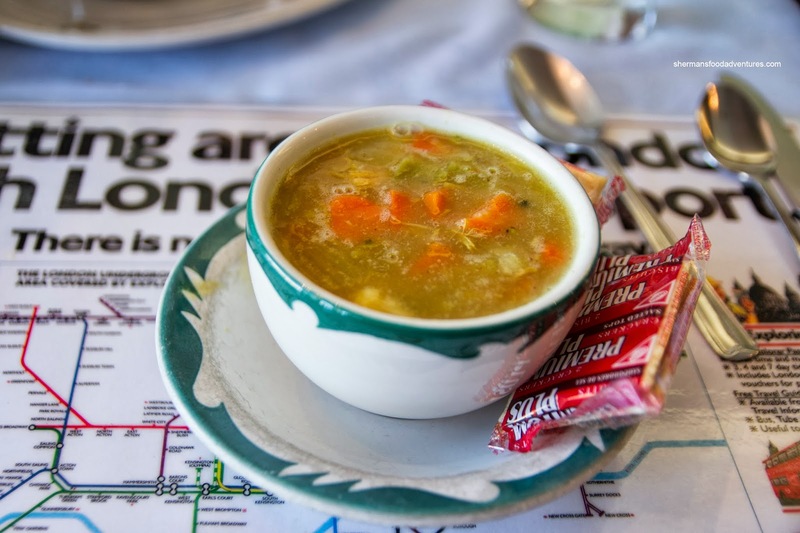 As much as there has been a significant British influence in BC (hence British Columbia), there are not a whole lot of dedicated English restaurants. 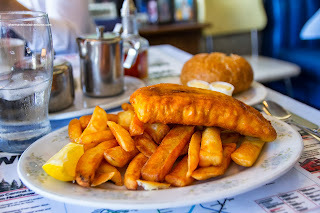 I'm not going to include Fish n' Chip joints because they only serve one thing and many are not even run by actual English (from England) folk. However, there is one near UBC called the Diner which has been around for 50 years. And yes, it is run by an old English couple. Choobee and I decided to experience this place on a whim while we were searching for eats along W. 10th. 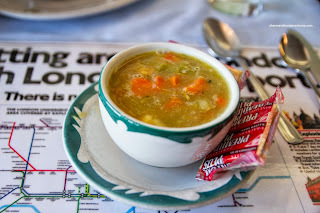 We were started off with a Mulligatawny Soup which was more like a hearty chicken vegetable soup with the trademark flavours of curry and lemon. I thought it could've used more curry, but in the end, it was not devoid of flavour or ingredients. A crusty bun with butter arrived next and we were "scolded" for not eating it since it would get cold. We obeyed and quickly started eating it with our tails between our legs. Our one piece Haddock n' Chips arrived with a large helping of crispy steak fries. The piece of fish was fairly large and graced with a slightly thick batter. Despite the thickness, we liked the batter as it was crunchy and surprisingly a lot less heavy than it appeared. Besides, it served its purpose by keep the fish flaky and moist. We were slightly disappointed by the prepackaged Kraft tartar sauce though. What's a visit to an English joint without trying the Steak & Kidney Pie, so yes, we got that too. It was doused in gravy that hid the inconsistent crust. I say that because the reheating resulted in some parts being dry and hard while the rest of it flaky. There was no absence of meaty chunks of steak inside which were mostly dry and chewy. I personally didn't any kidney in any of my bites. Either they did a stellar job in rinsing it or there wasn't any. 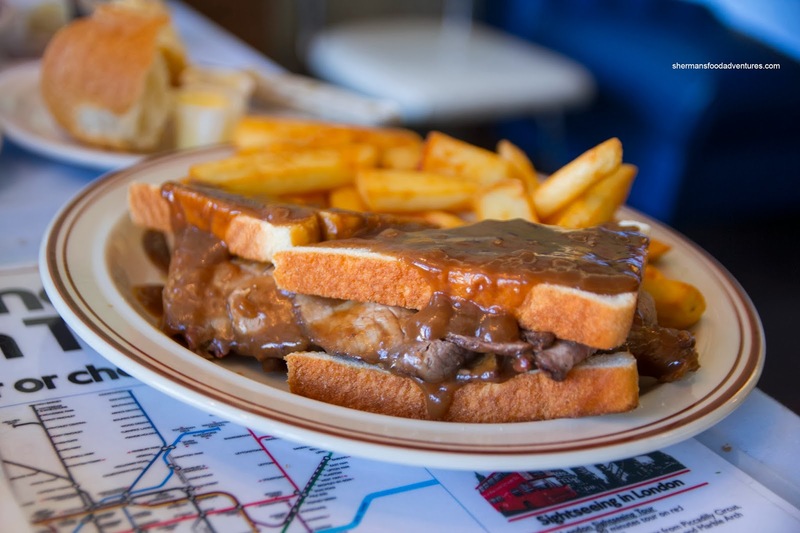 Lastly, and to the shock of the lady, we ordered a 3rd dish being the special of the day - Roast Beef Sandwich. 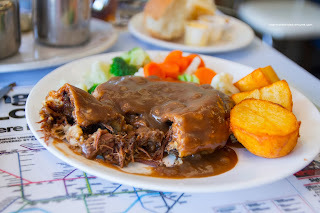 Smothered in the same thick gravy, the generous slices of beef were super tender and meaty at the same time. We really liked how it required no effort to chew. The soft bread was a nice compliment as well. I wouldn't go as far as saying the food was not good (even though English food is what it is), but the experience was neat and the older lady was a blast. Yes, she really has that British dry sarcastic wit about her. We got lollipops for finishing our meal. 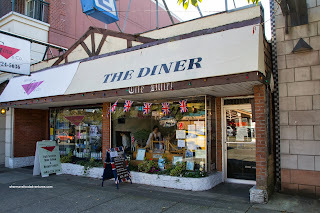 One time we ate there (years ago), owner lady asked me to sit down on a very specific chair (huh ?) so I did. Right then, she whips out a napkin and whips it in the air across my lap, lets go of it, and the napkin lands squarely on my lap. We watched in amazement. She didn't say a thing. It was hilarious.